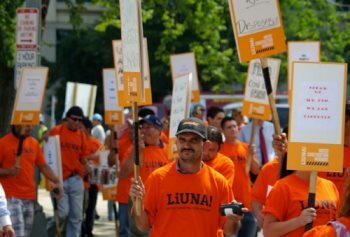 In the 21st century LIUNA has led the way for trade unions in its commitment to growth and member activism. In 2001, delegates elected Terry O'Sullivan, General President and Armand E. Sabitoni General Secretary-Treasurer. In 2006 and again in 2011, delegates re-elected both to office. LIUNA spearheaded the opening of its first construction charter school for high school students in 2003. The New England Laborers'/Cranston Public Schools Construction and Career Academy teaches students about the construction industry, opens the door to job opportunities upon graduation and has won praise from the community and the construction industry. When the deadly attack on the World Trade Center occurred on September 11, 2001, LIUNA members were first on the scene to help the rescue and recovery efforts and then later in the re-building of what would be known as Freedom Tower.